This HOLI add colors of profit in ur trades....!!!!! There is also another major difference. Trading is a full-time job because there is a continuous need to monitor positions and to make important decisions. Investing is something that anyone can undertake. Don't misunderstand. It is not a simple process. Instead it requires that an investor finds the time to do the necessary work for making important decisions. Unless you want to pay someone to manage your portfolio by buying mutual funds (a poor choice), ETFs (a good choice) or hiring a financial advisor, the successful individual investor does his/her homework. INVESTORS tend to hold positions for years, decades, or even an entire lifetime. As a consequence, they make few investment decisions. Investor portfolios should be examined on a regular basis (at least yearly) with the goal of unloading stocks that no longer deserve a spot in the portfolio. Alas, that seldom happens and many buy and hold investors believe in holding forever. Every option strategy comes with the possibility of earning a profit. There is also the possibility of losing money -- and that represents the risk of trading. Whenever you initiate a trade, you should have some expectation of the likelihood of incurring a loss when seeking the potential reward. Most traders have a market bias -- they initiate a trade when expecting that the overall stock market (or at least the price of the individual stock being traded) will move higher or lower. Such traders adopt a bullish or bearish strategy. · They have no opinion on market direction and by default, adopt market-neutral strategies. · They expect a non-volatile, non-directional market and elect to adopt market-neutral strategies. The iron condor is one such strategy. · Bullish Strategy: Earns a profit for the trader when the market moves higher. · Bearish Strategy: Earns a profit when the market declines. · Market-neutral Strategy: Earns a profit when the market trades in a relatively narrow range and all rallies and declines are small. Bullish and bearish traders earn money from market movement; i.e., they correctly predict whether the market rises or falls. Market-neutral traders earn money from the passage of time -- but only when rallies and declines are small enough that they do not generate a loss that is larger than the positive time decay. Ideally, the trader waits for Theta to work its magic. How Does a Trader Make Money from the Passage of Time? Options are wasting assets, and (all else being equal) lose value every day. Theta measures the decay rate. Traders who buy options must have their market opinions come true -- sooner rather than later -- or else the options bought will lose too much of their value while the trader holds onto the position and waits for his/her prediction to come true. Let's examine a typical iron condor. Let's assume that the premium collected is $2.00 per share, or $200 for one iron condor. The losing situation: When the stock moves too near the strike price of one of the options that you sold, its price increases rapidly and the iron condor loses money. Sometimes there is a good offset: If enough time has passed, and if the time decay is large enough to offset the entire increase in value, you may still have a profitable position. If the index (INDX) price nears 1230 (the short call option) or 1120 (the short put option), the corresponding spread gains significant value and the whole iron condor position would cost more to exit than the $200 collected when the trade was originated. As a result, the position is losing money or is "underwater." Options are special. They are unlike other investments because they were invented (circa 600 BC) as a tool for reducing and managing risk. In other words, one person (the option buyer) pays for the right to transfer a specific risk to the option seller. The seller charges a fee (premium) and agrees to take on that risk in return for the cash. When dealing with call options, in return for paying a premium to buy the option, the buyer gains all upside movement (above the strike price). The seller accepts the risk of losing a large sum if the stock price surges. For example, if you sell the right to buy 100 shares of a given stock at $50 per share to another investor, then you must deliver that stock if and when the call owner elects to exercise his/her rights. If that stock is trading at $70, you must buy stock at $70 and sell it to the call owner at $50. That is a loss of $2,000 (minus whatever sum you collected when selling the option). it is possible to gain protection against losing a large (essentially unlimited) sum when selling options. The way to do that is to trade a spread, rather than just selling calls or puts. The spread is a hedged (risk-reducing) position. Let's see how it works. In addition to selling the call option, per above, let's assume that you also buy a call option on the same underlying stock, with the same expiration, but with a strike price of $55 per share. 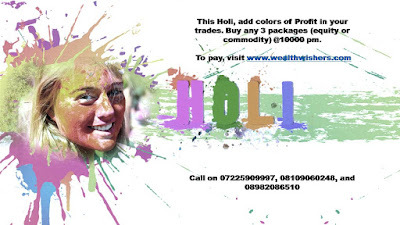 WISHING YOU AND YOUR FAMILY A VERY BRIGHT, COLOURFUL AND JOYFUL HOLI...!!!! It has been documented that on average, individual investors lose money from trading stocks. The majority of losses can be traced to trading expenses. However, those costs do not tell the entire story. Individual investors tend to buy stocks that underperform and sell stocks that outperform the market averages. A 2011 study looked at day-trader's profits and losses over a 15-year period and included something special: It traced the performance of the best and worst traders over a number of years, trying to discover whether successful trading is a "skill" or a random event. The conclusions: "The top-ranked day traders go on to earn money (after expenses) in the following years and the bottom-ranked day traders continue to lose money... Investor skill is an important feature in financial markets...The results of our analysis suggests that less than 1% of day traders are able to outperform consistently. Trading skill is rare." He concludes that: "Thinking that you can be in the elite group of performers without substantial deliberate practice and experience is stupid. I know of several day traders who have enjoyed very long careers of consistent success. Every one spends significant screen time absorbing market patterns and working on their craft. Is there any reason to believe that you and I can do better with options? I hope the bottom line is clear: A short-term trader in any market must have the ability to consistently predict market direction. Whether your holding period is 5 minutes, 5 hours, or five days, a short-term trader cannot afford to pay commissions unless he/she is accurate enough to come out with some cash -- after expenses are deducted. This remains an elusive skill for the vast majority. Trading options does not help traders for one very important reason: The bid/ask markets are much wider with options than with stocks. A short-term stock trader can buy a position and sell it for a gain of a few pennies per share. But options are different. If you buy a high-delta, in-the-money call option (and that is the type of option that speculators should buy, in my opinion), the bid ask spread may be forty cents to one dollar wide. Thus, when you buy the option (at a price near the asking price) there is no chance to quickly sell it at a profit when the stock price rallies by those same few pennies. It would take a far larger change in the stock price. Why? Because no one will be willing to pay much above the bid price for your option. When the bid and ask prices are not near each other, any you buy near the ask price, there is no possibility of scalping (buying and selling for a quick profit) with options. The same is true for spreads. To be able to complete a trade (buy and sell), the option trader must overcome the large price differential in the bid/ask prices. That money-losing phenomenon is known as slippage. My conclusion: It is far more difficult to make money as a day trader when using options than it is with stocks. There is no reason why anyone has to become a day trader. Option strategies can be adopted by traders who have longer time horizons -- perhaps a few weeks to six months. Such strategies include. Most investors invest their money in mutual funds or individual stocks. If you take the time to find good stocks that are worth owning, have you ever considered reducing the risk of stock ownership? We all appreciate the profit potential of investing during a bull market, but as you know, periodic bear markets can be financially and emotionally devastating. There is something you can do about that. You can hedge (reduce the risk of owning) stock. This article describes two simple strategies to do just that. 1. These strategies are not for everyone. 2. To gain the benefits of reduced risk, there is a cost. That cost can be either: reduced profits, or limited profits. Thus, if your goal is to earn the maximum possible profit from every investment, hedging is not for you. 3. The strategies do not eliminate all risk. They reduce risk. BENEFITS: Earn profits more often; reduce cost of buying stock. · To provide a small cushion that eliminates or reduces losses if the stock price declines. · As a steady source of income. · To earn profits when the stock price is not rising. The cash premium becomes the profit. · If a rally takes the stock price higher than the strike price when expiration arrives, your selling price for the stock is the strike price. You do not earn any profit above the strike price. Thus, it is a trade-off: You get cash, but must accept limited profits. One of my basic tenets of investing is the idea that a trader cannot find success without a healthy respect for risk. Therefore learning to manage risk is a mandatory part of any trader's education. Hedge: An investment position intended to partially offset gains or losses from another position. In the options universe such positions are referred to as spreads. In simple terms, a hedge limits profits and losses. When used properly, trading hedged positions increases your chances of having a profitable trade. If you have ever heard anyone use the expression "hedging a bet" this concept is the origin of the expression. In the options world, a hedge is the combination of two different positions. Most commonly, one of the positions is bullish and the other is bearish (although there are other risks, besides market direction, that can be hedged). · MARKET NEUTRAL. Such positions earn or lose money when the stock market undergoes a significant price change. You can construct the position to profit from the big move. You can also do the opposite: and own a position that earns money when the market is fairly stable and no such large price change occurs. · BULLISH. The hedge is created such that the bullish portion of the trade (terminology: bullish leg) is more influential than the bearish leg. That translates into a position that earns money when the stock moves higher. · BEARISH. The hedge is created such that the bearish leg is more influential than the bullish leg. That translates into a position that earns money when the stock moves lower. If you are brand new to options, the examples below may not mean anything to you. That's okay for now. MARKET NEUTRAL: Buy one call and one put; or sell one call and one put with the same expiration. These positions are calls straddles or strangles. BULLISH: Buy one call and sell another. Both options expire at the same time and the call bought is more expensive than the call sold and is a debit spread. Also: Buy one put and sell another. This time the put sold is more expensive (credit spread). The stock market is not only about making money. For many investors it is also a way of preserving capital, especially during periods of rapid inflation. · Selling some stock when prices have increased by so much that the investor is over-invested in stocks and under-invested in other asset types. · Buying additional stock when prices have undergone a significant decline and the investor is under-invested in stocks. The needed cash comes from selling the part of the portfolio in which he/she is over-invested. There are other methods and tools that investors can use to reduce the possibility of losing money from any specific investment. That reduced-loss situation is another way of preserving one's assets. And the tool of choice to accomplish that objective is the stock option. · A handful of rogue traders have gambled with money that was not their own and caused irreparable damage. News coverage emphasized that these traders used options or other derivatives in their trading and helped spread negative opinions regarding options trading. Examples: Barings Bank. Traders tend to ignore the nature of the business and rely only on their ability to predict short-term price movements. Investing is different. It is based on your ability to understand the basic financial condition of the company, compare it with its peers and make a good evaluation of how well-poised this company is for the future. That's research. When you find a business that is worthy of making an investment, you buy shares and wait for your good judgment to pay off. But you do not wait idly. Investing requires periodic re-evaluation of your holdings because the world changes and you do not want to be married to a poor investment. Option traders are not investors. Nor are they very short-term traders. The option markets, with their wide bid-ask spreads, are not designed for day traders. · Option buyers require that the stock make a move -- in the right direction -- in a relatively short period of time. · Option sellers require time to pass and for the options to decay without the stock moving in the wrong direction. Option traders also have built-in risk-measuring tools (the Greeks) that make it more efficient to use options than stock. The Greeks include Theta (the risk of holding as time passes), Vega (the risk of holding a position as implied volatility changes) and Delta (the risk of being too long as the market falls; or too short as the market rallies). These Greeks allow traders to get a good estimate of how much money is at risk -- as well as the potential reward -- that comes with their market prediction. Why do I believe that I can correctly predict which stocks are moving higher or lower? Even when traders lack proof of any ability to correctly predict direction, they still take bullish and bearish positions with a high expectation of making money. That is not reasonable. Predicting direction is difficult. Most professional money managers cannot consistently beat the market averages. And they are paid big bucks for that inability. Instead of trying to do what they cannot do, why not trade with a much improved chance of success? Options allow you to do just that. Puts and calls are obviously different option types. However, there is a mathematical relationship between calls and puts when the put and call expire at the same time, have the same strike price, and are on the same underlying asset. Because of that relationship, there is more than one way to build any option position -- and that means that there are equivalent positions (i.e., positions with identical profit/loss profiles) -- even though the positions appear to be very different. Although you can survive by avoiding the small amount of homework involved in understanding this concept, but it does mean that you will occasionally be leaving money of the table for no good reason. Isn't that why you are trading? To make money? Traders own positions with an expectation of earning a profit when the markets behave. If you can own a different position that results in the same profit (or loss), but which requires paying less in commissions, wouldn't that be preferable? Infrequently you may discover that the markets are temporarily inefficient (it won't last long), and that one of the equivalent positions is available at a slightly better (perhaps $0.05) price than its equivalent. If you spot that difference, you can own the position with that $0.05 discount. The basic equation is often referred to as put-call parity. You can find more details here. For the purpose of introducing this topic, the effect of interest rates is ignored. Put-call parity describes the relationship between calls, puts, and the underlying asset. money, your account will be assigned an exercise notice and you must buy 100 shares. In either case, you own stock. NOTE: If the stock is exactly at the money when expiration arrives, you are in a quandary. You don’t know whether the put owner will exercise and therefore, you do not know what to do with your call. The best solution is to buy the put to cancel any obligations. It should not cost more than $0.05. Next, if you do want to own stock, exercise the call option. If not, allow the call to expire worthless. By covering the short put, you are in control. COVERED CALL WRITING is a strategy designed to modify an investor's profile. It is not a magic strategy. · It a strategy for investors with a bullish bias. · It is not suitable for the very bullish investor because profits are limited. When you own individual stocks, exchange traded funds (ETF), or mutual funds, the value of your portfolio (obviously) moves up and down with the general movement of the stock market. As an investor, you may not have thought about the truth of the following statements, but in the back of your mind you surely understand that they are true. · Owning an ETF -- especially an ETF on one of the broad based indexes -- is an attempt to match the general performance of the stock market. The investor is not searching for ways to beat the market -- merely to match its performance. Such ETFs include: SPY (based on the S&P 500 Index), IWM (based on the Russell 2000 Index) , and QQQ (Based on the NASDQ 100 Index). · Investors who buy mutual funds are looking for out-performance, trusting the professional portfolio managers to choose investments that do outperform. In general, this is a poor investment plan because most fund managers fail to to beat their benchmark indexes. On top of that, they change an annual management fee for their failure. If you prefer to allow others to manage your money and make investment decisions for you, then you will probably do better with index funds and index ETFs, rather than traditional mutual funds. Sure, some mutual funds produce outstanding gains, but how are you supposed to find those funds in advance? You cannot. When writing covered calls, the most important part of the strategy is choosing which stock to own. It is true that you can add to your profits by skillfully trading the options, but that pales in comparison with how your overall results depend on whether the stock rises or falls. The objective with covered call writing is to find stocks that do not lose significant value. There is no need to find stocks whose prices skyrocket.